S -6° 16' 1" and E 14° 14' 24"
Mbanza Congo in Zaire Province with it's 24,220 inhabitants is located in Angola about 190 mi (or 306 km) north of Luanda, the country's capital. Local time in Mbanza Congo is now 08:30 PM (Sunday). The local timezone is named Africa / Luanda with an UTC offset of one hour. We know of 8 airports in the wider vicinity of Mbanza Congo. The closest airport in Angola is Mbanza Congo Airport in a distance of 1 mi (or 1 km), East. Besides the airports, there are other travel options available (check left side). Depending on your travel schedule, you might want to pay a visit to some of the following locations: Matadi, Uige, Kinkala, Cabinda and Kinshasa. To further explore this place, just scroll down and browse the available info. Let's start with some photos from the area. 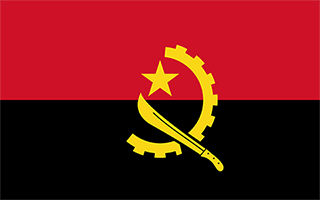 Zaire is one of the 18 provinces of Angola. It occupies 40,130 square kilometres in the north west of the country and has a population of approximately 600,000. It has a tropical climate. M'Banza Kongo, formerly São Salvador, is the capital of the province. Located at -6.26667, 14.2333 (Lat. / Lng. ), about 0 miles away. Mbanza Congo Airport or M'banza Congo Airport is an airport serving Mbanza Congo (also known as M'banza Congo or M'banza-Kongo) in northwestern Angola. Located at -6.26972, 14.2469 (Lat. / Lng. ), about 1 miles away. M'banza-Kongo (known as São Salvador in Portuguese from 1570 to 1975), is the capital of Angola's northwestern Zaire Province. M'banza Kongo (properly Mbanza Koongo or Kôngo in most acceptable orthographies) was founded some time before the arrival of the Portuguese and was the capital of the dynasty ruling at that time (1483). The site was temporarily abandoned during civil wars in the 17th century. It lies close to Angola's border with the Democratic Republic of the Congo. Located at -6.26667, 14.25 (Lat. / Lng. ), about 1 miles away. These are some bigger and more relevant cities in the wider vivinity of Mbanza Congo.